Can’t believe it’s our second day here! We finally got a good nights sleep, so this morning we were up early to head to the catacombs. In the late 1700s they decided to move the remains from the largest French cemetery to unused limestone quarries (due to public health reasons). Visitors can walk through the catacombs and see the bones and skulls in the old quarries, which are under both the metro and sewer systems. Sounds morbid, but it was really cool to see and worth the 2 hour wait (and only 4 euro to get in)! We then headed to the le marais, the Jewish area in Paris, to get falafel for lunch. It was really good; basically it’s fried balls of chick peas in a pita with eggplant, cabbage, hummus, and some sort of dill/yogurt sauce. We also stopped and got macarons, which are little French cookies…I got pistachio and coconut! From there we took the metro to the Louvre, which was closed today, so we just took pictures outside and at le Jardin Des Tuileries (the gardens)…we will head back to see the inside of the Louvre later in the week. From there we headed to the champs élysées, which is a famous street with a bunch of fancy shops (like Louis Vuitton). I bought my first Parisian non-food/drink purchase, which was natural a new purse…but it had sequins and bright colors, so two of my favorite things! 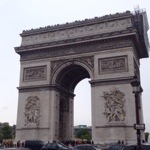 We then went to see the arc de triomphe, which is at the end of the street, and took some pictures there. Unfortunately it started raining, but we took the metro to a good viewing point to take pictures of the Eiffel Tower (we plan to go see it and climb up in it Thursday). Since it started raining harder, we decided to head back the apartment for a bit. We stopped on our way to get some groceries, and while we were there I had to get bounty bars…they are basically like almond joys without the almonds (and we all know I love coconut). We got wine, cheese, and a baguette, so we had our own happy hour and snacks at the apartment! We then headed to ile de la cite, a touristy part of Paris, for dinner. We had another 3 course meal (for only 12 euro); this one came with a complementary glass of wine! I also ordered a bottle of Kronenbourg, which is a French beer…it tasted like a lighter Stella. For the meal I ordered French onion soup, moules frites (mussels in wine sauce with French fries), and apple pie. Everything was great and we were super full! Tomorrow is supposed to be really nice, so we plan to head to Versailles and the Louvre, then go out at night again!